Floating islands of plastic in the Caribbean. When I was growing up in the 1950’s, plastic was one of the most exciting new materials. Everything from dinner plates to furniture were being made from plastic. It was lightweight, strong, and would never rot. 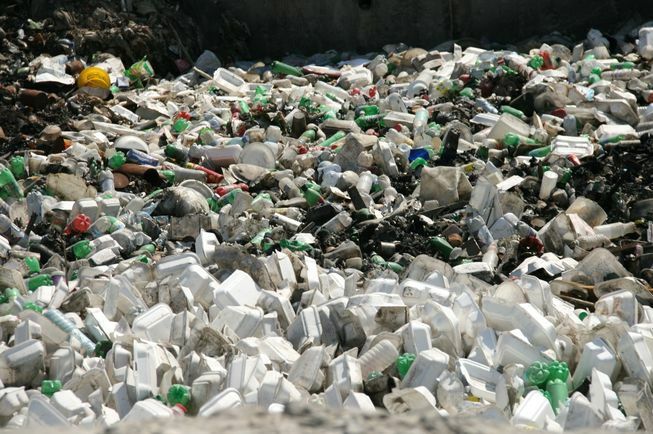 In the 1960’s film, The Graduate, Dustin Hoffman is pulled aside by his likely-to-be-father-in-law and given this sage advice in one word: “plastics.” So true: we now have 450 billion pounds of plastic on the planet and counting. We continue to add to it and never subtract because of the aforementioned fact that it will never rot. Every bit of plastic ever made is still with us today. The oldest is mostly in the form of nanoparticles that inhabit every niche on the surface of the Earth, including much of the food we eat and in all our bodies. The ocean is now known to have 36 times more plastic than zooplankton, the creatures at the base of the food chain. Since plastic does not occur naturally, many of its constituents are toxic to life. Plastic leaches toxins into the air and water and gathers to itself other oily toxins such as PCB’s. We all should be painfully aware of our part in this catastrophic proliferation of plastic. There is very little we can purchase that doesn’t come with some, or a lot of, plastic. What’s worse is that, unlike many of the original uses of plastic, much of the plastic of today is used once, maybe for only a matter of minutes, and then thrown away! We know this is awful, but how do we stop adding to it? We all know the mantra “Reduce, Reuse, Recycle.” Plastic presents some unique problems here. Let’s start with the last. We try to recycle as much as we can. With plastic the more proper term is “downcycling” rather than “recycling. Unlike food or yard waste, plastic is not made into more of the items that we recycle. Those must be made from new virgin plastic. The items you recycle become curb stops, decking, or some other lower use. And, it is still plastic and will continue to contaminate the planet, just a little more slowly. How much of our plastic gets recycled? About 8%. Another 2% is burned for energy — a difficult task to do without releasing toxins into the air. We can slow down plastic production by reusing our plastic containers and bags, but that plastic is still releasing toxins into our environment, perhaps a little faster as it starts to degrade. Only compostable plastic is a viable, sustainable option. Compostable plastic breaks down into minerals and nutrients that are biologically useable. Unfortunately, most of the compostable plastic now available will only break down in highly controlled conditions that exist only in industrial composting facilities of which there are very few. Still, in the future, compostable plastic might be a viable alternative for us, especially if it can be composted at home. That brings us to the first and best suggested strategy: reduce our use of plastic. Silicon, which is the sole ingredient in basic glass and ceramics is abundant and non-toxic. Glass and ceramics take a lot of energy to produce and are highly breakable, but are far and away our best alternative. Canning jars are everywhere as are many store-bought glass containers that can be reused. Karen Biondo, way ahead of her time, has, for some years now, been offering the “no-trash-bash-stash,” a collection of ceramic dinnerware, cups, glasses, and silverware for big parties, free for the using. Just pick it up and return it clean. What could be easier! Stainless steel is tough, nearly unbreakable , and reasonably inert, but is expensive (except for used silverware) so you want to use it where its qualities are most needed. Cloth bags can replace plastic for holding things but, do not provide a moisture barrier. An outdoor rodent-proof produce bin will keep your food moist and fresh for weeks, except in summer (that’s when you need a spring house). Wax paper can once again be employed to keep things like crackers dry and fresh. There are all kinds of engineering challenges and entrepreneurial opportunities in optimizing the qualities and usefulness of our plastic alternatives, as well as creating totally compostable, cheaply manufactured plastics. Another big challenge is collecting and transforming existing plastic into naturally assimilable minerals and nutrients. Right now, you can start getting plastic out of your life. You can stop buying products that use a lot of it, and you should write the manufacturer and tell them why you are not buying their product. And, of course, badger your friends and neighbors into doing the same. Remember, not so long ago we did fine without plastic.